Nucleus research found that companies are continuing to make new investments in cloud CRM to take advantage of new analytics, social collaboration, mobile, and other capabilities — and for good reason. Cloud deployments cost less, they’re faster to implement, and provide instant access to latest functionality. Learn more about how CRM pays you back and why cloud technology is leading the way. ¡Ingrese sus datos y descargue el informe! It is no secret that cloud deployments tend to be faster and have lower upfront costs, increasing ROI, but in the CRM space, cloud also means access to new features and capabilities and the ability to expand an application’s use over time with limited cost and disruption, driving greater benefit over time. 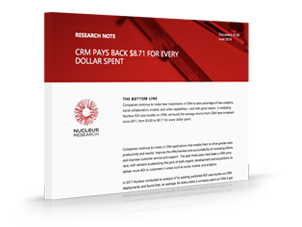 As more companies have moved their CRM to the cloud, they’ve been able to take advantage of the cloud ROI multiplier effect (Nucleus Research m108 – Cloud delivers 1.7 times more ROI, September 2012) for greater returns.